Our UCF Charge On! Electric Vehicle Display went well. We were successful in showcasing both EV owners and local EV businesses. The event set-up took about two hours, and the actual event took place between 10:00 AM and 4:00 PM. Positioning the EV Display in a hot spot at the University of Central Florida meant a lot of foot traffic. Students and community members visited to ask questions and understand sustainable transportation. No politicians participated. This was mainly a student-oriented event. In regards to improvements for next year, there are two main areas of focus. 1. The DriveElectricWeek.Org website. This website unnecessarily shields City Captains from being able to directly contact registered participants. Instead, we had to contact register-ees through the NDEW website. Barely anybody responded to these internal-website messages and this led to an extreme amount of confusion on both ends. While, as a city captain, I contacted all of our registerees to request for additional information (phone number, insurance, requirements), almost nobody was responding. Therefore, I could not fully integrate them into our event. On the day of the event, 25+ vehicle owners showed up expecting to be showcased. I had to turn the majority of them away. 2. Our location. The UCF Student Union is a small venue for Orlando, such a large city. We could only accommodate about 7-9 vehicles without endangering students, and this limits our ability to conduct a large scale event. Klaus Vietor talks with a student about his 2012 Tesla Model S. Numerous electric vehicles fill the backdrop. 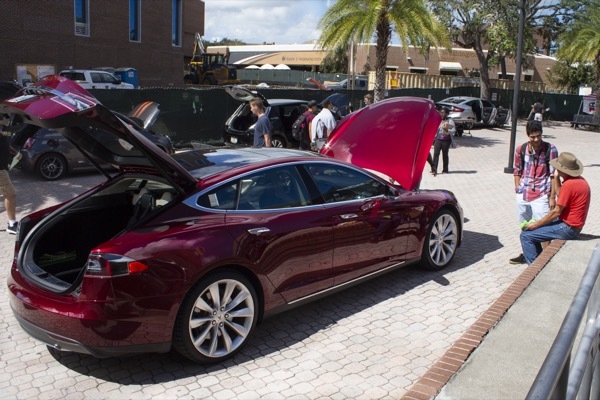 The University of Central Florida will be hosting an electric vehicle display to commemorate National Drive Electric Week . Come and view a display of fuel independent vehicles, interact with owners, and gain insight into the electric vehicle experience. The event will take place outside of the Student Union--an area with high foot traffic. Relevant community partners will all also be present. This event is free, and all are welcome to attend. If you have an electric vehicle you would like to display, please register and wait until you receive a response from the city captain. Registered attendees report 1,319,306 electric miles driven.